I am a self-proclaimed beach bum. Get me to a beach, with warm weather and calm waters, and I am pretty excitable. I have seen many a beach in my time too, but one of the most beautiful beaches I have seen was in San Andres, Colombia. With views of the sea of seven colours, white sands and some of the clearest waters, it’s hard not to be impressed by San Andres. San Andres is part of an archipelagos which also includes islands Providence and Santa Catalina, Bolivar and Albuqueque islets, Cotton, Haynes, Johnny, Serrana, Serranilla, Quitasueno, Rocky, and Crab cays and Alicia and Bajo Nuevo sand banks. In 2000 it was declared a World Biosphere Reserve by UNESCO and is actually closer to Nicaragua and Jamaica than Colombia. 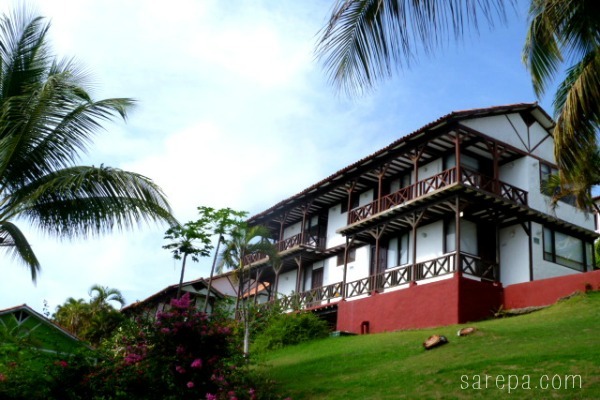 If you’re planning to travel San Andres, then lucky for you there’s no shortage of places to stay. Whether you want a luxury ocean-view hotel, a place to dump your bags downtown or somewhere far away from the disturbances of civilisation, there is sure to be a hotel to meet your needs, and your budget, in San Andres. 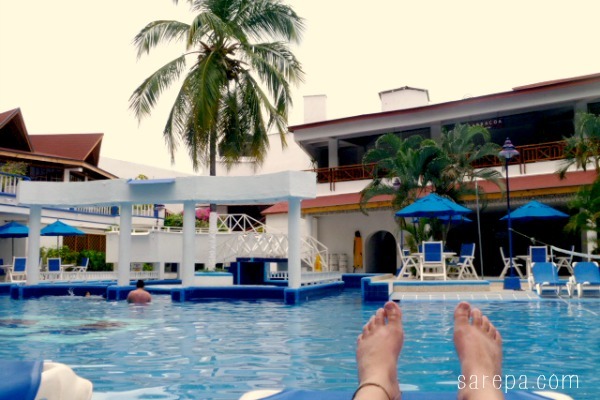 I stayed at a great hotel called Sol Caribe Centro and centro it definitely is. It’s just two blocks from the main boardwalk along the beach, has a huge pool, more than 200 rooms, great restaurants (BBQ, Mexican, Italian, Seafood and the buffet), a game’s room and loads of activities throughout the day and night. We stayed for four days with the full package which included breakfast, lunch, dinner, beverages (alcoholic and otherwise) and snacks all included. Talk about being spoilt! I love my food, and a big part of any holiday for me is the food – learning about local dishes, eating what the locals eat. But the sad truth is that food is extremely expensive in San Andres. Importation costs of fruit, vegetables and other food items means that there are very few food establishments on the island and the ones that are set up there, are very expensive. I got talking to one of the locals, a woman who was actually from Cartagena but who had been living on the island for more than 20 years, and she told us about the situation. The high cost of fruit and vegetables, the fight locals go through on a daily basis. 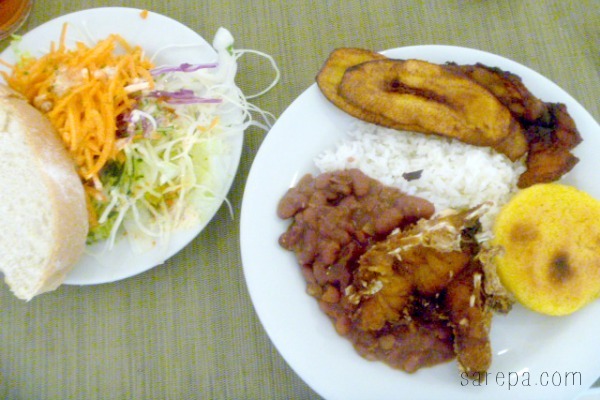 So, a word of warning, if you are planing to travel San Andres, look for a hotel which has a food plan included. You will save your pennies doing so. Back to Sol Caribe Centro – the great thing about this hotel is that there are actually two hotels in two different locations owned by the same company, about 15 minutes driving away from each other, and if you are staying at one hotel you can use the facilities at both locations. Awesome. Sol Caribe Campo is much more quite, it’s further away from the centre of town and actually has it’s own private beach about a 10 minute walk down the road. We went along to the private beach on one of our spare days – there are free kayaks for hire, free banana lounges and sun tents, a beach volleyball court, a bar and aerobics and dance classes. I stayed away from the volleyball game, seriously volleyball in bikinis just cannot happen for me, but I was all about the dance class and a the kayaks. Buddha Villa – We drove by this place during our trip around the island. It’s about 10-15 minutes out of town and is secluded with what looks to be a lot of privacy. It’s also just across the road from a rocky beach. Decameron – At the higher end of the scale there is Decameron Los Delfines, there are a bunch of Decameron Hotels on the island. It’s got ocean views and is just a hop, skip and a jump from the centre of town, centro comercial, shops and, of course, the beach. El Viajero – For backpackers, there is a El Viajero backpacker hostel on the island. I haven’t stayed at this hostel but I have stayed at their hostel in Cartagena which was clean, spacious and had pretty good services. Staff service wasn’t amazing, but everything else was pretty great. So, if you’re planning to travel Colombia and want a relaxed beach getaway, don’t look past San Andres. Digging your heels in the sand with a piña colada in hand is the stuff dreams are made of. 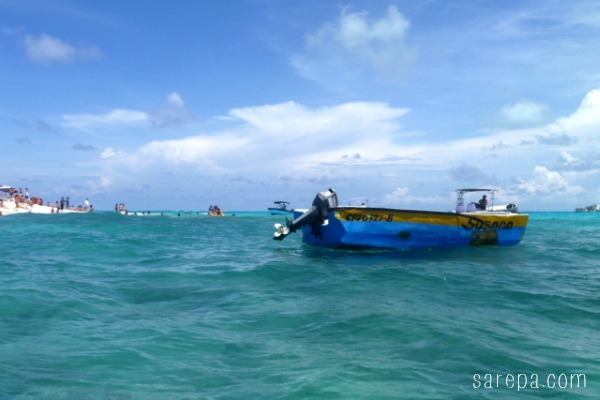 Pingback: Things to do in San Andres – Travel Colombia | sarepa. Thanks Leola! Glad you’re enjoying it. I live on San Andres and there are no private beach all are owned by the Colombian Govt. an opened to anyone.